As some of you know, I’m in the midst of helping build a chaordic living systems enterprise. Our core group is currently having fascinating conversations about mission, values and the kind of culture we want to cultivate amongst ourselves, which in turn will inform what we model and inspire in the world. As the days go by, we’re becoming more comfortable opening up to each other and really unpacking our core beliefs. This is helping us find alignment and coherence, which must happen before we construct our shared vision and lay our foundation. I’ve been thinking a lot about open-source philosophy, creative work, and a passion-driven lifestyle. While on my flight out to San Francisco yesterday, I reread a book from my graduate work called The Hacker Ethic: A Radical Approach to the Philosophy of Business. (a hacker, btw, is defined as “an expert or enthusiast of any kind”). They laid out some core values of the hacker ethic, which felt very much in alignment with the way I operate and how I’d want to interact with my colleagues in this creative economy. How do these 7 values strike you? This post really caught my eye, as I have taught business student the “chaordic” model, but was not too sure if many people are actively using it these days. I have seen one or two agencies refer to it, but not many. (I have written a paper where I discuss the model here – http://wp.me/p11Bag-9Z). I think your values are superb. I think there is only one comment, and it may well be that you feel that this is already expressed in your values, is that for me, if I was writing out values for my own organisation, I would want to say something along the lines of people are not at the top of some pyramid, but we are an integral part of nature, we do not stand outside of nature. Therefore business should be in service to nature as well as humans, where all beings on this planet are recognised as having rights, as well as humans. Not too sure if that is a little too hippie-ish, but these that you have a really excellent values for your project. It will be really interesting to hear how your project goes. These values are ones to live by for sure. members of the world/planet community. to be more accurate than ‘caring’. action and feels more heartcentered. and can neglect to do our own inner work. Can you name the opposites to these seven in definite terms? Opposites clarify definitions and choice when they show up as two clear options, like a real 2-way fork in the road. For example, what is the opposite of the [Activity] value? I’m super-interested in this. I would suggest ‘respect’ and ‘patience’ are fundamentally vital concepts to any community. I’d also say the golden rule of ‘reciprocity’ is (despite some misgivings and adjustments required) is another value that should be instilled at an early day. But that’s not to say that your list isn’t excellent it’s just that a community is not exactly a business and we must assume that not everyone will agree. It’s like the ‘action’ point, complete freedom of expression isn’t really possible where people differ in extremes, and they will. For instance if am allowed complete freedom I’m going to continue to be a meat eater, simon above would argue the point, probably passionately, have enough people in both groups and you have a divide, I would say it’s my right of complete freedom they would say it’s unethical and shouldn’t happen in the community. A nudist in a community even a chaordic one will probably annoy someone with strong Judaic religious ideals. I’m not saying they aren’t great ideals I’m just playing the devils advocate or maybe looking at this like a dialectic dialogue, please help me see things differently. On the subject of reading I would read about the ideas of Abraham Maslow as he has written extensively on things that create the conditions in which humans prosper. Venessa – thanks a lot for this! Point 1 – Passion : intrinsically may not come from nowhere, only from somewhere where others can not easily look, or know about. My passion for collective learning, and lean thinking (making current processes more joyful through applying gracefully technology) stem from an experience after my apprenticeship at a bank back in 1988. Being passionate about dealing with stocks (with realtime information via Reuters) I ended up in the housing department for the last weeks before I moved to study economics. It was not just boring, rather the processes were broken as some handwritten info was transformed on rewritable LPs and then back to the computer to print out a letter. I was constantly thinking about making the whole job more enjoyable through making the process more fluent, leaving time for the value adding, and conversations with the clients (which there was not much time). These 7 values overlap, of course, as human value systems are always going to be based on the core principles and beliefs that we cherish as individuals and in our communities. 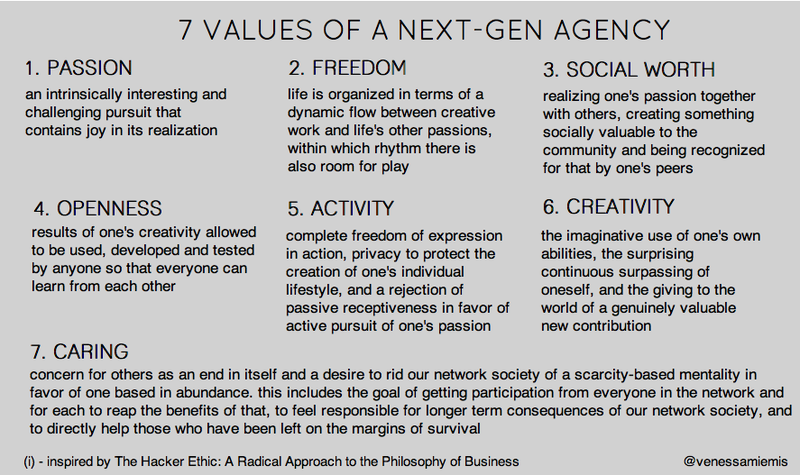 I believe that not only Next-Gen Agencies, but organizations of all kinds, will in the future share these core values. Age-old standard “business as usual” consequences, such as war, poverty, hunger, debt, and unnecessary suffering are not only unnecessary, but are unacceptable. These 7 core values of future-thinking organizations should be the basic tenets upon which we plan and engage with our fellow humans and our planet. There is no excuse to accept anything less from ourselves and our fellow men.